William Morrow Paperbacks, 9780060887452, 304pp. While being pregnant is thrilling, the responsibility of a growing baby can provoke anxiety about what is and isn't safe. 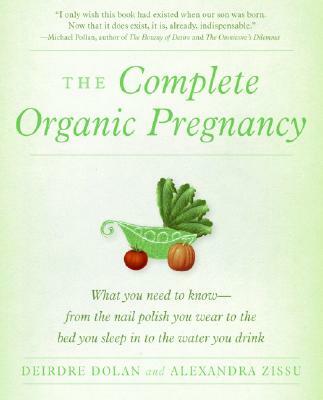 In The Complete Organic Pregnancy, Deirdre Dolan and Alexandra Zissu address how you can minimize your exposure to the invisible toxins that surround us—in everything from food, cleaning products, and cosmetics to furniture, rugs, air, and water. Step by step, they tell you where dangerous chemicals are lurking, why it's so important to avoid them when pregnant, and what you can do before, during, and after your pregnancy to protect your child. In this exhaustively researched book, the authors (calmly) talk parents-to-be through everything from the safest laundry detergent to which crib mattresses contain toxic flame retardants. You'll find out how to choose the right face cream, plastic water bottles, household cleaners, types of fish, and much more—all with an eye toward keeping you and your baby safe and healthy. Deirdre Dolan is a journalist whose writing has appeared in Harper's Bazaar, Rolling Stone, and the New York Times Magazine, among other publications. She has written columns for the New York Observer and the National Post, and is the author of Curb Your Enthusiasm: The Book. Alexandra Zissu is a writer and editor who has worked at T: The New York Times Style Magazine, the New York Observer, Details, and Lifetime magazine. She has also written for Vogue, Organic Style, and Health magazines, among other publications.